This is for you, SonyaAnn, and any one else who is "filling up the gift cupboard" for next year. 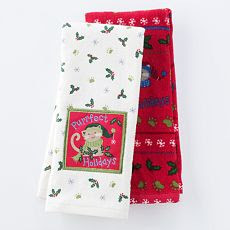 Hop on over to Kohls store clearance and check out these adorable Cat Kitchen Towels. They are priced at only $.99 and TODAY ONLY, shipping is a low price of $.99 per item. For $1.98 (plus tax) you can have a terrific gift for that cat lover in your family! There is also an adorable Heartland spreader set for $1.69 (reg. price $16.99) and a beautiful Spirit of the Season Star Accent Plate for $1.49 (reg. price $14.99). If you see something that interests you, hurry up and go on over there, because deals like these do not last long!! Sorry I hit send before I was done! Yay, I'm special! You mentioned me in your post. I'm heading over there right now!!! I hope that you weren't feeling blah for too long. Oh man I was going to get those beautiful plates but I must have been too late they are all sold out!